What is dimensional weight and why is it important? Dimensional weight is the volumetric weight of packages. Freight carriers then utilize the greater of the actual weight or dimensional weight to calculate shipping charges. In Pulse Commerce, the Weight field should contain a product's dimensional weight. Please be aware that this property is calculated slightly differently depending on the shipping company. Having accurate dimensional weights will ensure that your items will have the appropriate shipping costs associated with them. Using your primary shipper's calculator, you can enter the dimensions of the package, along with your product's actual weight to find it's shipping weight. This is the number that should be entered in the Weight field of your product in the Pulse Commerce system. Here, the actual dimensions of the box for this item is 9in.x10in.x1in. It's ACTUAL weight is one pound. 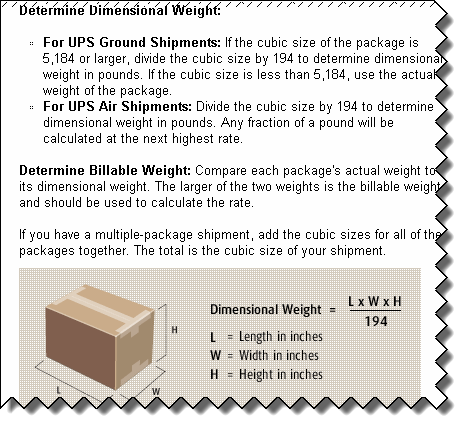 Using UPS's dimensional weight formula, (9x10x1) / 194 = 0.46lbs. Since the original weight is greater than the calculated dimensional weight, the original weight should be entered into Pulse Commerce's product editor. Note: Dimensional Weight is only an issue for large, non-dense objects. for normal sized, average weighted objects, there is little difference between the weight and the dimensional weight. In this case you might consider just adding a small handling fee to cover any difference.